Everything Changes – The Guide to Young Adult Cancer » Cancer Burden: How close can you live to a highway? Cancer Burden: How close can you live to a highway? My husband and I have moved twice in the last two years. Both times our housing searches included ruling out apartments and houses in close proximity to a highway. My man is an environmental attorney who enforces and defends the Clean Air Act. He knows a lot about environmental carcinogens and together we have figured out how to make logical choices about potential environmental harms. Numerous studies show a connection between highway pollution and cardiac disease, pulmonary disease, childhood leukemia, and lung cancer. Benzine, butadine, and particle-bound polycyclic aromatic carbons are some of the carcinogens emitted by vehicles. Diesel soot is particularly carcinogenic and people who live near freeways are exposed 25 times more to soot particulate pollution. This can get confusing because our country is dominated by highways – even small, two-lane rural routes are sometimes called highways. Studies I have read, such as one from the Sierra Club, suggest the greatest health risks are posed by highways in urban areas with dense population and industry. One study sited the danger threshold as a highway that has 20,000 cars per day. To put that number into perspective, the largest bottleneck areas in the country (interstate exchanges in cities like Chicago, Seattle, Washington DC, Atlanta, LA) have between 160,000 – 300,000 cars per day. To find out how many cars traveled the major roads in the area where you live, google “Annual Average Daily Traffic” + your city, region, or state. When searching for a new apartment or house, if I read about a promising listing, I first google map the address to see how close it is to a freeway or major highway. If it is within 200 meters I don’t look at any pictures or make appointments to see the place. Why disappoint myself? We have ruled out entire neighborhoods bordered by freeways, missed out on great rents, and passed up charming apartments for the sake of trying to reduce our carcinogens. I don’t think that living near a highway necessarily means I will end up getting cancer again. And if you are a young adult cancer survivor living near a highway and cannot afford to or don’t want to move, I don’t think it means you are doomed either. But, if I have the choice to make, I will choose a home with a lower carcinogenic burden, greater than two football fields from a highway. 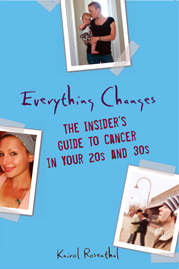 To read more about cancer and the environment, check out Everything Changes: The Insider’s Guide to Cancer in our 20s and 30s. I read your comments, and I share your point. In my case, I live in Lima, Peru, and it is a very contaminated city. The rich people, by the way do not live in Lima, but prefer to live in Miami US. Tha is way people live on average only 65 years here. I live by Lenin St. in Naryn, Krygyzstan. A lot of my friends are dying of lung cancer. Can I blame air pollution for their deaths? Am I next? Should I become an environmental refugee because my government is careless of our health? could you possibly provide me with the link to some of your sources? I am studying biochemistry at UCLA and I find this matter quite intriguing.